If you missed the solar eclipse last month, you’ll get another chance on April 8, 2024 when another one will be visible across the United States. I was lucky enough to catch the August 21st eclipse. I traveled to Idaho to observe it, specifically the town of Rexburg which was in the line of totality. The dry climate was ideal for the event and when the moment arrived and the moon completely covered the sun I felt like I was observing a single entity. Something alive. I felt special, like I had been given a back-stage pass to life and the universe. And as quickly as totality came it was gone and the sun was shining again and it was all over. That’s when I took off my eclipse glasses and really looked at them. They were the paper ones, like old 3-D glasses. I had a new found respect and appreciation for them. The little black windows had allowed me to see so much. I had bought them on Amazon and hadn’t really given them much thought. But now I wanted to know all about those little black windows. All I knew about them was that the material used in the glasses had an analog in welding glass. I grabbed my phone and took a tumble down the internet rabbit hole, and after clicking a few links I found myself deep in welding country. There I found out about these welding helmets that have sophisticated lenses which automatically darken to protect the welder from ultraviolet (UV) and infrared (IR) light once the torch is lit. 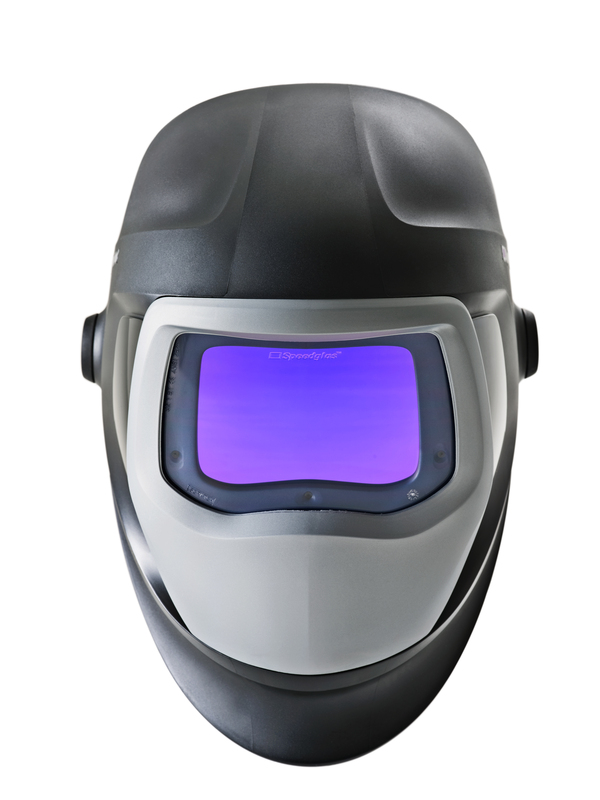 The auto darkening feature allows welders to keep their helmet on at all times during a job. Some welding helmets are even solar powered so that the energy used to power the helmet comes from the arc light itself. 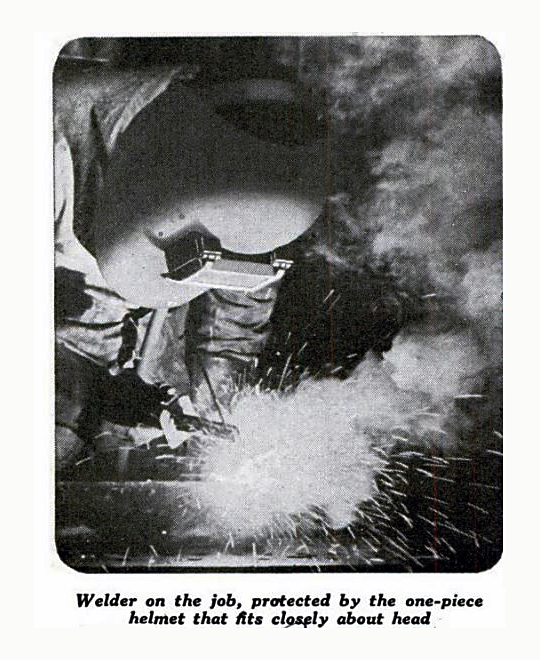 The first welding helmets were introduced in 1937 by Wilson Products. Before 1937, which means throughout all the big construction projects of the first quarter century of the 1900s (Empire State building, Chrysler building, Hoover Dam etc.) all the welders and steel workers had for protection were a measly pair of goggles or a face mask. Now, these did protect the eyes to an extent, but many welders of the era suffered from photokeratitis, a painful condition which is like sunburn of the eye. Moreover, goggles left the face completely open to sparks and debris, and face masks hindered work. The welding helmet was a great improvement but their fixed polarized lenses were often too light or too dark for the job, leaving the user vulnerable to UV and IR rays. They could also cause chronic neck pain from having to flip down the face mask before each weld. Fortunately, a doctoral student working on ways to protect welders in the Swedish shipyards came up with the auto-darkening filter (ADF) used to create the first commercially viable self-dimming welding helmet in 1981. A combination of liquid crystal elements, polarizers, and electronics, ADF helmets darken automatically when sensors detect the bright welding arc. This type of helmet quickly evolved into a precision instrument perfect for all types of arc welding and cutting. Some even come with air filtration systems. Hornell International introduced the Speedglas auto-darkening welding helmet in 1981. 3M, which acquired Hornell assets in 2004, now sells Speedglas welding helmets like this model from 2008. Before the advent of sophisticated self-dimming filters, your average steel worker relied on a shade chart to gauge what degree of protection was needed for a particular job. Be it stick, MIG, TIG, or even PAW, the welder would have to take into account the arc current and electrode size and choose a minimum protective shade of welding glass suitable for each job. The protective shade spectrum ranges from two to fourteen. Most sources recommend a number 14 or higher if you want to use a welding helmet to view a total solar eclipse. However, the NASA eclipse safety website says that you can use shade number 12 or above. So, if you ever have the opportunity to see an eclipse and you can’t get a hold of a pair of eclipse glasses, you know what to do. You won’t want to miss the next eclipse in 2024. The line of totality will stretch from Texas to Maine.